When you think of wasabi, you automatically think sushi and sashimi, right? But what about including wasabi in a savoury dip, or even a cupcake? 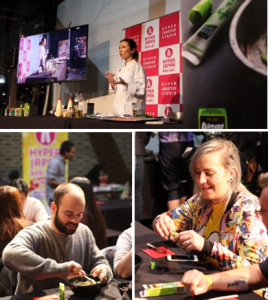 It might sound a bit out-there, but participants at two special workshops organized by S&B Foods at the recent HYPER JAPAN Christmas Market 2016 discovered for themselves just how versatile an ingredient wasabi can be. own popular restaurant, DOGS Mika’s Kitchen and Bar in London’s Canary Wharf. With her truly global background, few chefs are better qualified than Mika to skilfully incorporate the traditional Japanese taste of wasabi into more Western dishes. During this workshop, participants had an opportunity to prepare three tempting dishes; wasabi cream and smoked salmon pate, avocado and shrimp with wasabi mayonnaise and finally wasabi hummus. Each one was designed to showcase the unique charms of the wasabi taste, and its versatility. It’s just as much at home with the ingredients Brits know and love as smeared on sushi or sashimi. 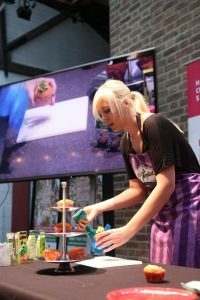 The second workshop at HYPER JAPAN was led by Sarah Hilleary, the founder of B-Tempted, which is a high-end gluten-free bakery based in East London. Its wares are sold in Harrods, Fortnum & Mason and other prestigious outlets, and have won many Great Taste Awards. They’ve even supplied cakes to members of the British royal family for official engagements! The event attracted many eager participants, all keen to find out whether wasabi would really work in a sweet cupcake. The answer to that, judging by their reactions, was a resounding yes! Using a cupcake infused with wasabi and lemon zest as a base, and with the aid of green wasabi icing, participants were able to create cute-Christmas themed treats, while learning techniques such as how to pipe a rose using icing. Participants at both workshops commented that while they were aware of wasabi from visits to Japanese restaurants, they hadn’t used it themselves in cooking, and were pleasantly surprised at how successfully it can be incorporated into other kinds of cooking. Those who tasted the wasabi cupcakes in particular were struck by the exquisite balance of sweetness and the distinctive spiciness of the wasabi, and how successful it was. Wasabi looks certain to become a more common store cupboard staple among amateur cooks around the UK!